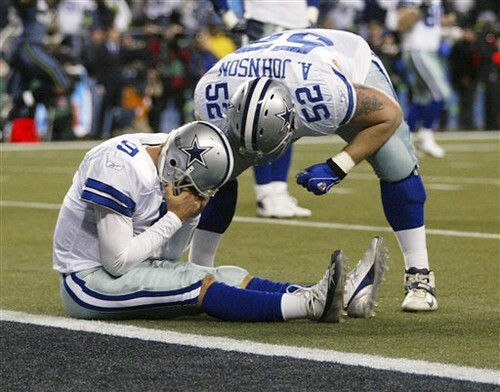 And now, we finally have a photo to replace this one of Tony Romo weeping at the end of Seattle 21, Dallas 20 on January 6, 2007. Said a friend as we were watching the predictable demise of Dallas, no image better defines Cowboys 2008 than this one, screengrabbed by The 700 Level (and, no doubt, every Philadelphia Eagles fan). There's this lowlight reel as well, compiled by a Romophobic and scored, of course, to that Daniel Powter song "Bad Day"; No. 9 deserves that awful song. Then, to top it off, a fall in the shower -- injured rib, bruised everything else.